What Do You Do When Your Dream Is Broken? Broken dreams can bring disappointment and suffering, yet God can use these times in the wilderness to humble our hearts and delight us with new beginnings. Sheridan and Merryn Voysey candidly share their broken dream and how they ultimately found peace. Sheridan writes openly about it in When God Says NO, and the couple shares their experiences in the DVD A Journey Through Broken Dreams. 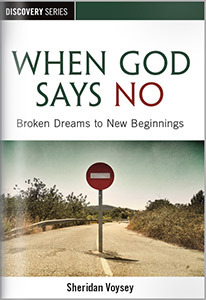 Get your FREE copy of When God Says NO.